This week’s Detroit motor show saw the unveiling of the third-generation Lexus IS, sparkling in its finished production form. The new IS provides a little brother to the GS and is pitched into the same ballpark as the excellent BMW 3-Series – a tough place to land unless you are really rather good. It’s too early to say how the new car might measure up, but at least it has bravery on its side. While the bigger GS tries so hard to feel German it ought to come with a little green hat with a feather in it, the new smaller saloon seems more confident in its own skin. Looking as if it might have been styled with the help of a sharp Samurai sword, the new IS resembles little else on the road, particularly around its boldly slashed rear. The headlamps, featuring a separate tick-shaped daytime light, are also pleasantly unique. It’s equally good to learn that the new Lexus will be available as a hybrid for the first time. 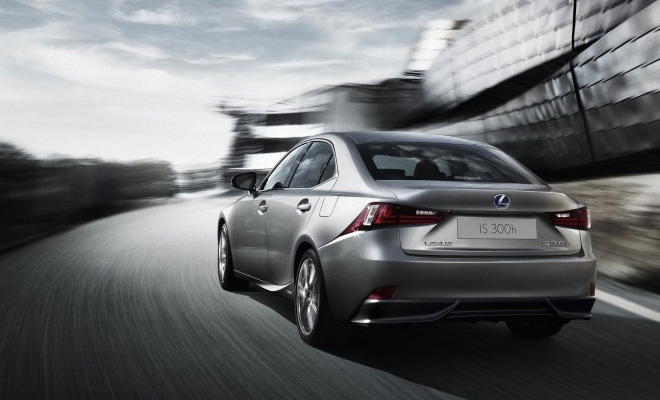 Official figures for the IS 300h variant haven’t yet been earned, but Lexus is predicting a sub-100g/km score that would make it an attractive company car option, promising low benefit-in-kind tax, zero congestion charge, reasonable hybrid car insurance costs and – hopefully – decent residuals. The IS 300h will be powered by a new 2.5-litre four cylinder petrol engine twinned with a substantial electric motor, the pair working in concert to produce a peak output of 217bhp. Like the Toyota Prius and other hybrid Lexus powerplants, the new engine adopts an Atkinson-cycle approach to valve timing, prioritising fuel efficiency over power output. 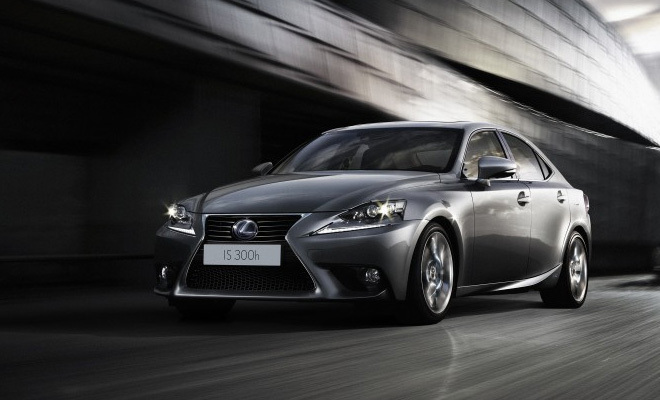 There will also be a non-hybrid option for UK buyers – the IS 250 – powered by a 205bhp V6 petrol engine. Both the hybrid and V6 versions send drive solely to their rear wheels. Lexus should have little trouble hitting its sub-100g/km, 65mpg fuel efficiency goal for the new IS hybrid given that the company has hinted in the past that a very similar-sounding powertrain will wind up in the substantially larger and heavier GS, and still duck below 100g/km. And talking of size, the new IS measures only a finger-width longer than the outgoing second-generation model, but has gained a handspan of extra length between the axles. The longer wheelbase benefits passenger knees at the expense of a slight ungainliness in side view. The rear wheels sit a little further back in the body than they might for the perfect stance, giving the new car a slightly stretched appearance. 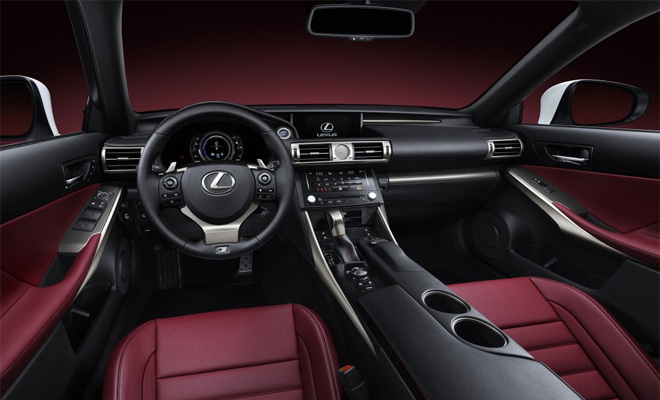 Inside, the cabin resembles a scaled-down GS with added swoops and bulges. I’m not sure the giant double cup-holder atop the centre tunnel looks very premium, but the materials employed ought to be first rate. 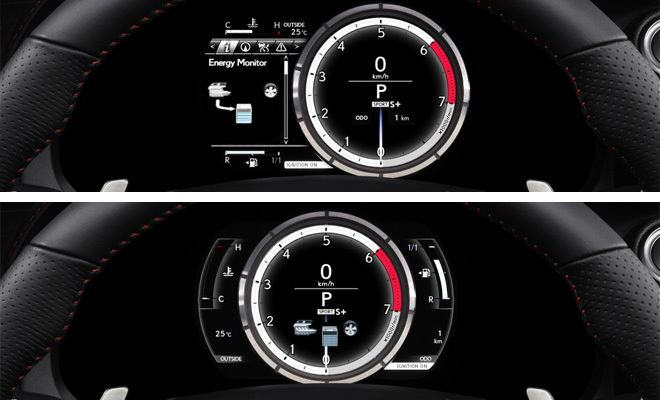 One party-piece that I think comes with the F-Sport trim level is a uniquely configurable dashboard, allowing the driver to choose between a central dial flanked by two small displays, or an offset dial alongside a single large display. And while we might expect this kind of trick to be achieved entirely in software these days, Lexus has gone surprisingly old-school instead. It has built a hardware dial that trundles from centre to side on a whirring servomotor. These kind of quirks are welcome, because one of the strongest impressions I got when driving the GS 450h last year was that it was trying too hard to be something it wasn’t. 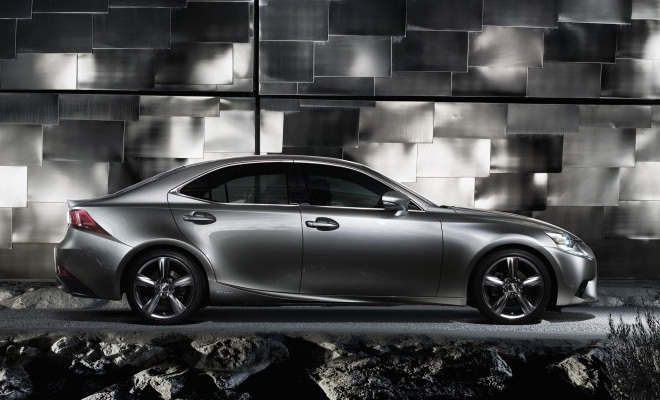 A Lexus with a clearer sense of identity – striving for excellence on its own terms – could be a real winner.